Facing the inevitable death of an aging pet can be a traumatic experience, and Sandra Soroka of Troy, NY, decided to make the transition easier by adopting a second cat. 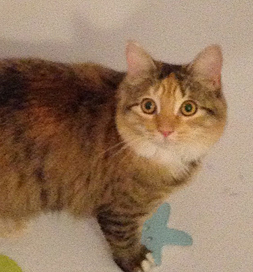 At first, she just casually began to look at kittens, but when she saw Alicia (now called Charlie) listed on Petfinder by Courageous Cats of Malverne, NY, she says her heart stopped. This had to be the cat for her. She emailed the rescue only to find to her disappointment that the kitten was already spoken for. Read the story in Sandra’s own words. Sandra halfheartedly continued to search, but didn’t see any other kitten she was interested in. Alicia had seemed so perfect. “About a month later, I saw her on Petfinder again!” she says. “I got so excited I emailed right away.” She learned that the pending adoption hadn’t gone through. Now Sandra’s heart soared. Here was a second chance. She quickly filled out an application and then headed to meet the kitty. “As soon as I met her, she fell asleep in my arms,” Sandra says. Though others had applied to adopt the kitten, and even met her, there seemed to be a real connection between these two. That cinched the adoption. Sandra took Charlie home, got a new job and moved, all at about the same time. While in the process of all of this, she placed her old cat, Clyde, with her mother so as not to add to the cat’s stress. Charlie has brought new life to the Soroka household and will make future inevitable transitions a little easier for Sandra. That’s thinking smart and helping a homeless cat at the same time.